Owning a small business online, and being able to make it roll properly is a big responsibility. Your business needs to be automated well, all processes must be synchronized perfectly, because only this way will you be able to become successful. The present article is a Worketc review which will help you understand how it helped us become a leading entity in the SEO and internet marketing industry. We at SEOLIX have been using Worketc for closer to an year. Worketc works great with our process and help us streamline many things at one place. Our rating = 10/10 !! This Worketc review will help you too see how easy it is to bring efficiency into your business, because only after you have can manage all tasks efficiently can you focus your primary attention on generating the profits that you need. You can manage all aspects of customer relationship through one single platform. Recording every aspect of communication with every client/ staff member through one single application means that you will greatly save precious business time and money after all. Project management- follow tasks, assign them, record any problem and solve it as easy as 1-2-3 thanks to a project management platform that makes collaboration extremely easy. You definitely will not have to jump back and forth through tens of applications anymore. This very Worketc review will help you take your online business to higher standards. Google Apps & Gmail- the most widely used interfaces for perfect collaboration online. Now, through Worketc you’ll have access to a CRM for Gmail- which means that your entire business can now be powered from inside Gmail. Android, iPhone and Mobile- the flexibility of Worketc management system stretches beyond limits. Now you can keep everything under control, even while you are away from your usual PC screen. You can collaborate 100% efficiently from your mobile thanks to Worketc useful applications. Sales management software- you can collaborate extremely easily on sales, set the sales alerts and all the other actions, and certainly you can generate very easily detailed reports. Make clients want to come back, by listing them on your email marketing list. One more extremely important aspect this Worketc review will teach you is that the platform is currently available with a 2 weeks free trial. You can sign up on their main webpage, and you’ll have access to all these top management applications that will help your business finally compact, strong and productive. Worketc has worked for us very well, and compared to all the other management platforms out there, this one actually comes packed with the most value for its price. SEOLIX is committed to a result oriented service. While we work on our clients’ projects, we take time to find out the latest news in the online marketing arena. 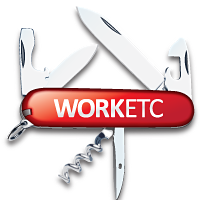 Visit Worketc Now and Try for Yourself – the 14 days trial doesn’t require credit cards.